Volume X in the Lace Wars Series; an Expansion Kit for Remember Limerick! Pro Religione et Libertate (PRL) is the tenth volume of Red Sash Games' Lace Wars series, and is an expansion module for Remember Limerick! Toward the end of the 17th Century, at a time when Europe is consumed by war, the powerful Catholic dynasty of the Habsburgs, and the Pope, have formed an unnatural league with the Protestant states of northern Germany, and with the Prince of Orange, de facto ruler of the Netherlands, against their coreligionists, the French. They oppose the overweening ambitions of the Sun King, Louis XIV. To augment the strength of the League, William, Prince of Orange, has taken advantage of popular dissatisfaction with his father-in-law, King James II, to engineer an armed coup and take over the government of England. This will help fill the coffers of the League and ensure that England does not ally with France. Remember Limerick! 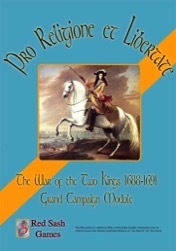 covered the war between King James II and King William III in Ireland during the years 1689-1691. PRL adds the theatres of England and Scotland and lets the players simulate the Glorious Revolution of 1688, when William of Orange invaded England with a Dutch army, and the Scottish insurgency of 1689-1691. Two Grand Campaign modules allow the players to simulate the entire war in the British Isles by combining PRL and Remember Limerick! In each case each player controls the forces of one king. Added to the troops available in Remember Limerick! are additional Dutch and English regiments, militia forces, Scottish Highlanders, and King James' entire pre-war army. The War of the Two Kings began with the Glorious Revolution of 1688, a seminal event in British history that institutionalised Constitutional Monarchy and modern party politics. The Revolution is often portrayed as a popular revolt against James' attempts to establish Absolute Rule. On one level this is true, but in its execution the Revolution was strictly a coup d'etat - William invaded England with a Dutch army 'fronted' by English and Huguenot (French Protestant) exiles. King James, suffering from a nervous breakdown, did not challenge his nephew on the battlefield, but fled to France. His flight has obscured the fact that William's invasion was a dangerous gamble. If James had fought it is quite likely he would have won. 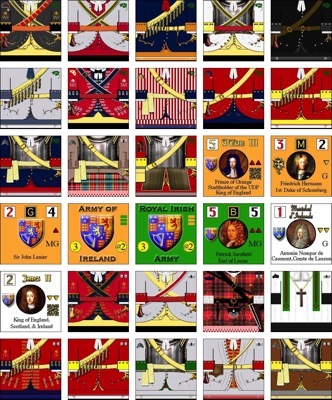 The 1688 scenario and campaign game allows the players to see what might have happened if King James had met his nephew on the battlefield or waged a war of attrition against him. After losing his throne, King James was persuaded by Louis XIV of France to attempt a reconquest, leading to his landing in Ireland in the spring of 1689. A counter-invasion by the forces of the new King of England, William III, led to three years of warfare in that island, as examined in RSG's game Remember Limerick! (published 2009). In addition to examining the Revolution, this module provides errata and updated material for Remember Limerick!. Just as war broke out in Ireland, James Graham of Claverhouse, otherwise known as Bonnie Dundee, raised an army of Highlanders to challenge the Williamite government of Scotland. (Scotland accepted William as her King separately from England, since these events took place prior to the Union of the two countries.) Dundee, a brillant commander, was killed in battle very early on, and his successors were not particularly effective, but his opponent, Major General Hugh MacKay of Scourie, had difficulty persuading the Government to give him the tools he needed to put down the insurgency. MacKay and Dundee had once been comrades and rivals for promotion in the Dutch Army. Though he lost the battle in which Dundee was killed. and though Dundee has the martyr's glow, MacKay was perhaps King William's best divisional commander - setting aside the unparalleled John Churchill. 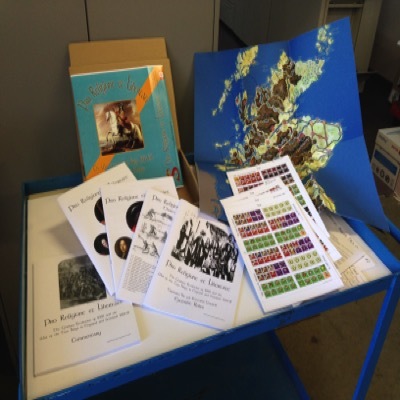 The 1689 scenario and campaign game allows the players to see what might have happened if Dundee had not died. There is also a bonus scenario for Monmouth's Rebellion in 1685. Monmouth's Rebellion provides an interesting comparison with the 1688 campaign, since the basic strategy was the same, while both sides' forces were far smaller in 1685. 1) One map representing England. Scotland, and Wales, derived from a mix of modern cartography and period maps. Scale is 4 leagues (16 Km) per hex. 2) 420 die cut counters representing the forces of the Williamites and the Jacobites: Irish, English, Scottish, Dutch, French, Danish, and Huguenot. Scale is Battalion - that is, the playing pieces represent battalions and regiments. IMPORTANT. Ownership of Remember Limerick! is required to use this module.